To sync your products you'll first need to log in to your Shopify store, or head to your dashboard if you're already logged in. Scroll down and click on the Apps button in the left-hand menu (the one next to a little jigsaw piece icon), then find the Inkthreadable app on your list of installed apps. We'll explain the process for syncing an existing product, but if your store doesn't have any products currently listed then you'll need to start with the article for creating and syncing new products. Tip: If you want to use printed neck labels with your garments, it's best to set these up before linking any products. To do this, head to your Brand page (or click the 'Edit your brand profile' link at the top right of the app welcome page. If you're ready to get started, click the Link Products button. You'll see a list of each of your Shopify products and the Inkthreadable product they're linked to, if any. In this example, a couple of products have already been linked. But one hasn't. The Love Pug T-Shirt exists as a product in the Shopify store but has not yet been linked to an Inkthreadable product. To fix this, click the Edit button. On the next page, you'll need to assign the product you'd like to use for fulfilment. Click the Link button and select the product you'd like to use from the drop down menu. We'll be using Continental Clothing's N03 Classic Cut Jersey Men's T-Shirt. 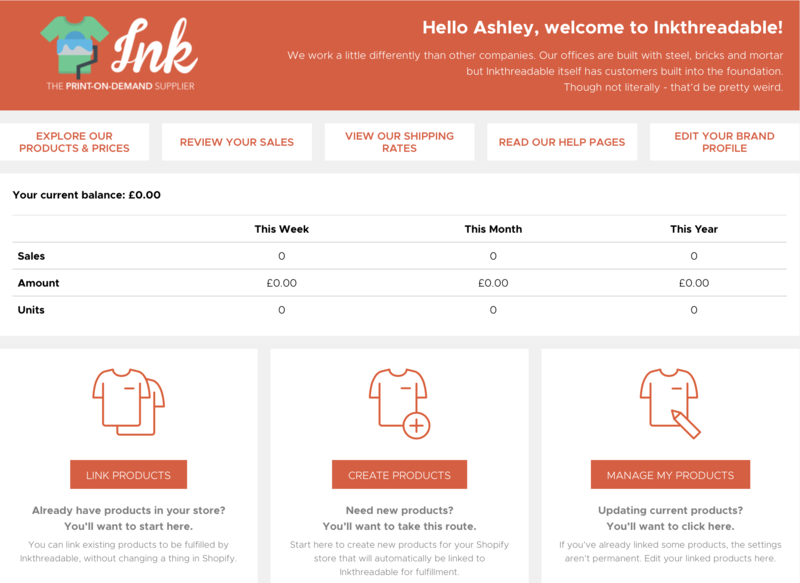 The next step is to link variations of the Inkthreadable product to variations of the Shopify product. When you check the box next to any variation details are auto-populated; it's very unlikely these will be right, so the next step is to change the details. 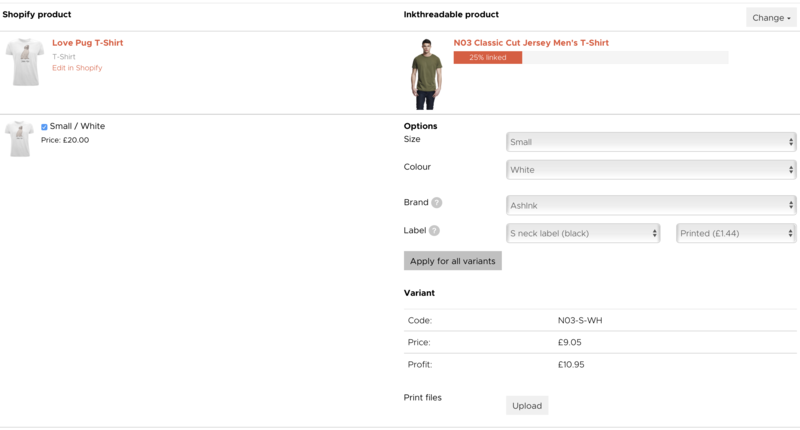 By selecting the correct options from the drop-down menus in the inkthreadable product column, the first Shopify Product variant is now correctly linked. There are two optional extras you can set up here: a DTG printed neck label and a custom print file. If you'd like neck labels printing you'll have need to upload these to your Brand Profile, but if not you can leave this set to 'none'. Any labels you've uploaded will be available as an option from this drop down menu and adding one to the garment will add £1.51 to the cost of production. There is an option to upload a print file to be applied to each variant at the bottom of the page, but you have the option to assign print files individually in the case that one or more of your variants will require a different print file. Since all variants for this product use the same print file, we've left this empty. At the bottom of this page are two final requirements: uploading a product mock and print file to assign to each product variant. The product mock allows us to quality control the item, and the print file gives us the means to do it. Please ensure your print file is in our print template. If you've assigned print files individually as you've gone along you won't need to do this, but if you haven't then you're required to upload one here to be assigned to all variants. You'll be returned to your list of linked products. The green bar next to each represents the percentage of variants that have been linked. If any of these progress bars aren't at 100% you'll need to click Edit again to see what was missed (unless it's intentional! ).